"We love it . . .and quite frankly, I don't understand how someone couldn't have one. To make the investment in a pool . . . and then only receive the investment return for 3 or 4 months out of the year, makes no sense to me at all from a cost/benefit analysis. To add a little more to the investment (your building) in order to receive the total return from the overall investment for 12 months out of the year, it the best cost/benefit solution. 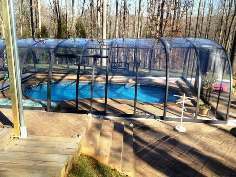 Thus, we have one of your enclosures . . .plus, we simply enjoy getting the use of our pool all year long."